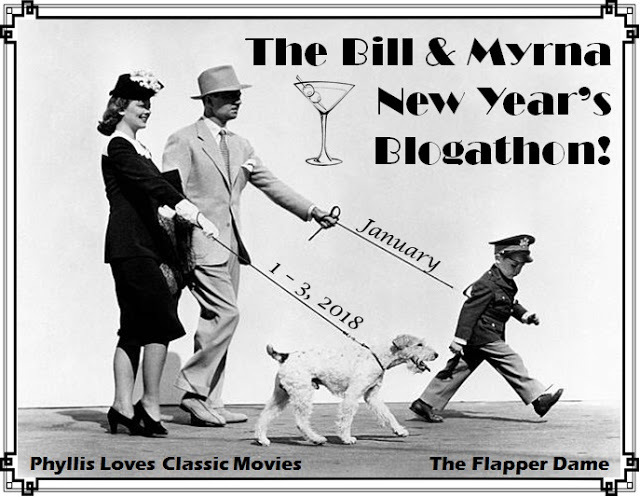 Phyllis Loves Classic Movies and The Flapper Dame are our hosts for The Bill and Myrna New Year's Blogathon running from January 1 - 3. Talk about starting the new year right! Click on our hostesses' blog names for the entries to the blogathon. Frances Goodrich and Albert Hackett adapted Dashiell Hammett's serialized 1933 novel The Thin Man for the screen for MGM in 1934. Directed by W.S. Van Dyke and starring William Powell and Myrna Loy in the first year of their legendary teaming (Manhattan Melodrama), the movie was a popular hit that garnered four Oscar nominations. One of the nominations went to our married screenwriters. 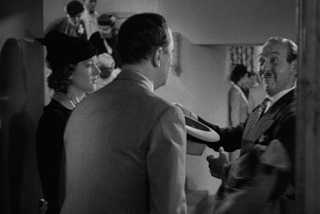 The popularity of The Thin Man made it an excellent candidate for a sequel and that job naturally fell to Goodrich and Hackett. 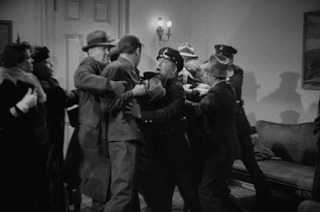 Their job was to imagine what happened after the thin man case. 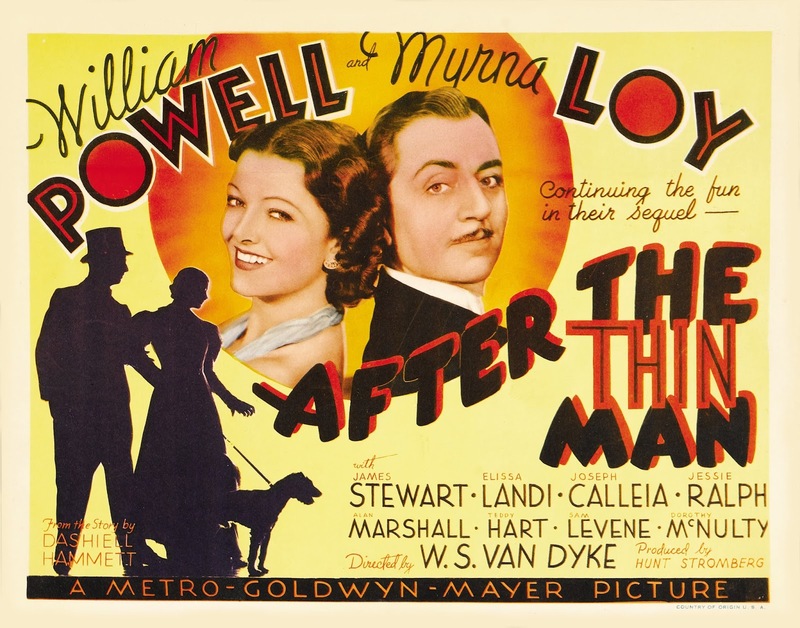 Aha, After the Thin Man became the title and the template for the titles of further sequels, letting the audience know what to expect in the way of entertainment and stars. Once more, Goodrich and Hackett received an Oscar nomination for their screenplay. The 1936 release has us catching up with Nick and Nora where we left off. They are on the train bound for California after wrapping up the Wynant case a mere week ago at Christmastime. They have reached their home turf of San Francisco in time for New Year's Eve. 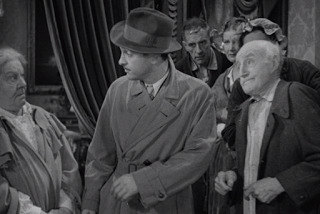 We overlook the fact that Nick and Nora look two years older, and that it took at least a few days after Christmas to finally solve the thin man case. We overlook all of this because we are so happy to see them again. Nick: "New Year's Eve at home. Or would you know that this is New Year's?" Nick: "I suppose you got ideas, huh?" Nick: "I was afraid so." Nora: "I'm going to lock the door, plug the bell, cut the telephone, and crawl into bed for a month." Nick: "Nora, you're my favorite woman." Beyond the welcoming front door is a riotous welcome home party. Half of the guests are strangers, and all of the staff is being run ragged. The hoped-for peace and quiet is nowhere to be found, and capping it off there is a phone call from Nora's Aunt Katherine (Jessie Ralph). 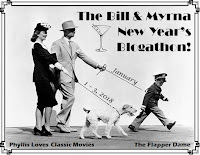 Nick and Nora's presence is demanded at a New Year's dinner at the Nob Hill mansion. 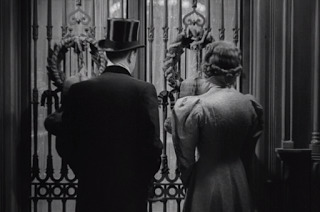 Beyond that imposing front door, Nora's elderly relatives form as unpleasant a gathering for a New Year's Eve party as you are likely to come across. Bossy Aunt Katherine, sly cousin Lucius, deaf Aunt Hattie, pompous Uncle Willie, cousin Helen, cousin Emily, and 83, and darn proud of it, and Aunt Lucy. The entire group disapproves strongly of Mr. Nicholas Charles. Nora: "Nickie, pull yourself together." Nick: "One squint at Aunt Katherine would sober anybody up." The only relative Nick can stand is Nora's cousin Selma (Elissa Landi). It is for Selma's sake that Nick and Nora have been summoned. Selma's ne'er-do-well husband Robert (Alan Marshal) is off somewhere on a toot, and Aunt Katherine wants the wastrel found before any untoward publicity. Selma: "Can you indefinitely go on caring for someone who doesn't care for you?" David: "Well, it's been done." The evening almost looks like it can be salvaged when Selma's former beau, David (James Stewart) puts in an appearance. Nick and Nora almost get the younger folks to join them on the town, but Selma backs out because she is nearing hysteria over her worry for Robert. The only clue they have is a vanity case that was mailed from a night club. Dancer: "Oh, Mr. Charles, how are you?" Dancer: "I want you to meet my partner. This is Lum Kee, Mr. Charles. You sent his brother up, remember?" The quiet night at home had morphed into a night with the waxworks, and now a night of clubbing. Nick and Nora head to a place called The Lichee, and it is a happening place this New Year's Eve. Nick runs into all sorts of people from his old life. Some of them may hold a grudge. One of the owners of the club (William Law) has a brother that Nick put away. 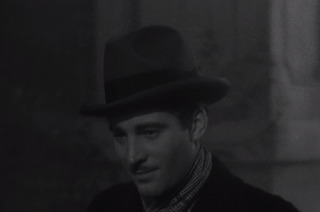 And the other (Joseph Calleia) is only too happy to make Mr. and Mrs. Charles comfortable. Dancer: "Is he a friend of yours?" Nick: "On the contrary, a relative." Dancer: "He's been hanging around here for three days, drunk. Got a case on our prima donna." 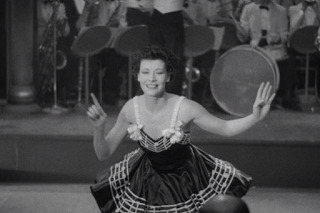 The woman in the case and Robert's life is the club's entertainer, Polly (Dorothy McNulty), later Penny Singleton). The audience is treated to a couple of numbers from the ebullient vocalist before she hustles Robert out into the night. They aren't the only ones traipsing the foggy streets at midnight. Lum needs to take a drive. Dancer is missing from the club. David walks the night alone. A late visit from a dismissive Robert has a distraught and armed Selma roaming the neighbourhood. A shot rings out and there is the end to Robert Landis' sordid life of entanglements. Selma: "He was going away and I tried to stop him." David: "Now, Selma, listen to me. Now listen. I want you to go back to the house. You've never had a pistol, you understand? You hear me? You've never been out of the house tonight." 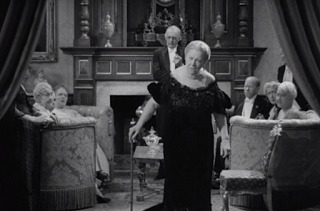 Aunt Katherine: " Mr. Abrahams, how dare you question my servants?" Lt. Abrams: "Lady, a man's been killed. I got to find out who did it." Aunt Katherine: "Surely you don't think..."
Lt. Abrams: "How do I know what to think if nobody will tell me anything?" Now the fun starts with Lt. Abrams (Sam Levene) torn between two investigations, one back at The Lichee with Nickin chargee, and one dealing with Aunt Katherine on Nob Hill. Abrams can't even interrogate his prime suspect, Selma, as she is under the care of an eminent nerve specialist, Dr. Kammer (George Zucco). Lt. Abrams is going batty! Nick: "Well, this is a fine way to start the New Year." Nora: "Get me out of here." What a delicious way to start the new year, at least movie-wise. A murder on a fog-bound street at midnight. A boatload of suspects and persons of interest, each with their own conflicting intentions. And Nick Charles on the case. At one point our lovely Nora ends up in the slammer. Once back home, Nick and Nora have to wrestle with Asta over a clue. The press is all over the case and Aunt Katherine is appalled by the publicity because Selma is the prime suspect. Polly, the singer, has a close relative (Paul Fix) who knows too much and ends up another victim. In The Thin Man (1934) we spent some time in silence as Nick sleuthed his way around Wynant's laboratory and offices. It was where he made a major discovery and formed a theory on the case. 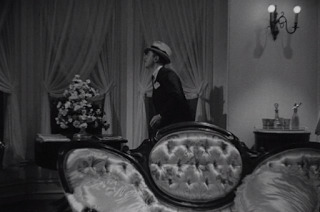 In After the Thin Man, we enjoy a similar scene as Nick investigates an apartment which was a lover's hideaway for Polly and Robert. What else does he find there that leads to a shocking discovery, and an attempt on his life? Nora: "Go on, Nicky, it's just getting good." As is his wont, Nick gathers all of those involved in the case in one spot and boldly confronts one and all with their crimes. The assembled suspects don't take it too well. Punches and threats are thrown. None of this phases our Nick. 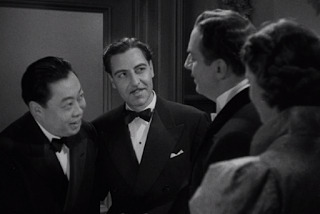 William Powell is equally engaging whether he is walking around a room looking for clues, or holding court with a captive audience. Myrna Loy as Nora always has his back. We know they are a team. Nick: "What's that?" (Nora's knitting) "Looks like a baby's sock." Nora: "And you call yourself a detective." After clearing Selma and handing the real killer to the police, we are right back where we started. Nick, Nora, and Asta are back on a train heading who knows where? I suppose they are looking for that elusive peace and quiet. Do you think they'll find it? I think they'll find Another Thin Man. "I never enjoyed my work more than when I worked with William Powell. He was a brilliant actor, a delightful companion, a great friend and, above all, a true gentleman." I mean how can you not love Nick and Nora as portrayed by Powell and Loy? The first time I saw this one, I was surprised by James Stewart's character. I love that you included some of the film's quotes. Spending time with Powell and Loy, and with Nick and Nora is like getting to hang with the coolest people on the planet. Even if I'm wearing my yuckiest pajamas and am behind in dusting. You've put me into the mood to wrap up in a blanket (it's -6 here) and watch ALL of the Thin Man Movies. I really enjoyed your use of the dialogue from the movie, particularly: Nick: "One squint at Aunt Katherine would sober anybody up." Cozy is definitely the order of the day, and who better to have inside with you than Nick and Nora? This deep freeze is unbearable. Today it was -12 Celsius here, which is 10 degrees Fahrenheit. It looks like no break in the weather until the weekend. Had no idea Stewart made a Thin Man movie. How is he in this? He is very good. It is an intriguing character and he is definitely an "actor to keep your eye on". I can't decide which is my favorite Thin Man, the first or the second. They're both brilliant and loads of fun. 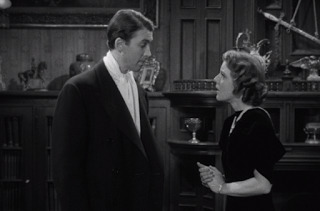 It also delights me that Jimmy Stewart makes an appearance. Sequels are always tricky, but I think Van Dyke, Goodrich, Hackett et al. hit it out of the park. I agree. The sequel could have gone either way, but with the right folks at the helm it equals the joys of the original. I missed this blogathon, but did my own version of Nick and Nora to end the year. That was loads of fun, but your commentary on this pair and movie made my day. Enjoyable as always. Thanks so much. Who better to usher out the old and greet the new with than our pals, the Charles? 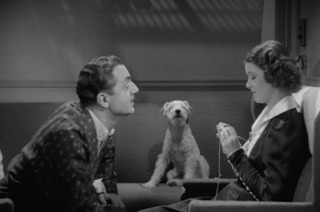 After The Thin Man manages to be as delightful as the first movie. I also enjoy the third movie a lot. Your review was great, as always - it refreshed my mind in many moments! It is nice to be reminded of favourite movie moments. Thanks for stopping by. I always appreciate a visit. I'm not a huge Thin Man fan, but do enjoy the movies, especially rapport between the two stars. And I think this is a case of sequel being better than the original! They truly stepped up for continuing the series. I've been a fan for years and I have not gotten weary of this one. Love this film, and you've captured it so beautifully. I love when you talk about a dramatic moment, and then quote Nora to punctuate it: "Nora: 'Go on, Nicky, it's just getting good.'" Why didn't I watch this on New Year's? I just watched the first one again a few days ago. Clearly, the wrong choice, especially since I can't get enough of that scene with Nick and the elderly men falling asleep. Nick at that table talking to the assembled snorers is priceless! I think you just have to pretend that it is New Year's Eve all over again. Get dressed up nice and fancy. Enjoy the movie!